The first battle in the Noakes Sydney Gold Coast Yacht Race went to Jim Cooney’s Comanche, the imposing black and red supermaxi narrowly leading the Oatley’s same-length Wild Oats XI to Sydney Heads on a mild winter day, closely followed by Peter Harburg’s Black Jack, another 100-footer. 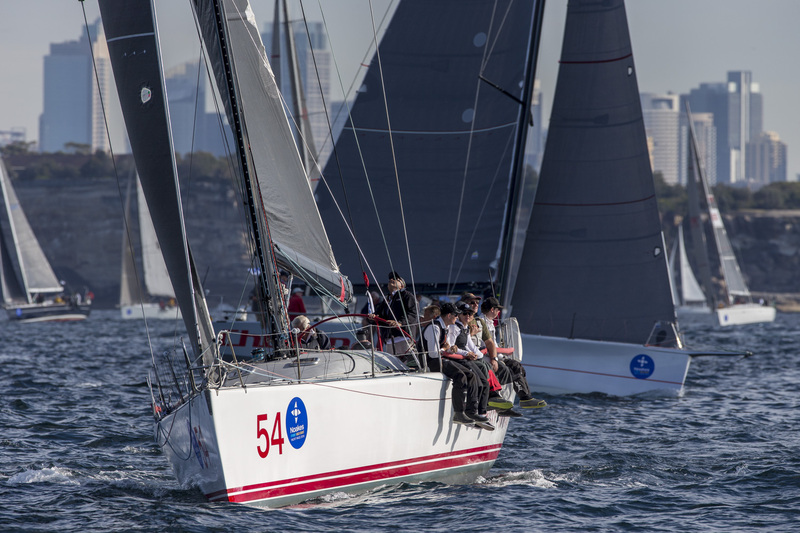 Eight knots of NNE breeze thankfully filled in from Watson’s Bay to allow a start 50 minutes after the planned 1pm start of the annual 384 nautical mile challenge, the first test of the 2018-19 calendar of offshore races organised by the Cruising Yacht Club of Australia in Sydney. Three were individually recalled for breaking the start. 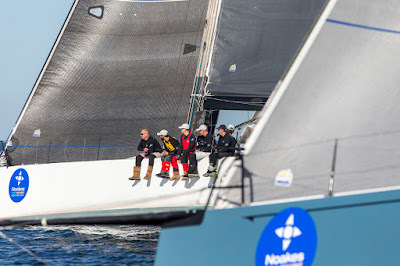 “We got the side of the harbour we wanted – the western side. It was a nice clean start for everyone. Jimmy Spithill (America’s Cup skipper) took us over the line and I took her through the heads and off the coast. Our routing has us finishing in the early hours of Monday morning, between 2am and 6am. 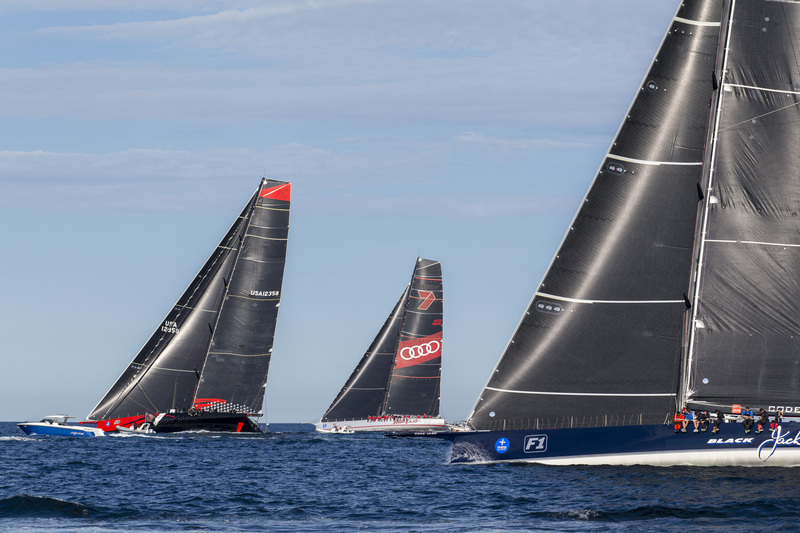 Conditions are not ideal for Comanche; we’d like more breeze,” Cooney said an hour-and-a-half into the race. The fleet is setting up for a cold night sail pushing up the New South Wales Hunter Coast in northerlies which are forecast to dominate until Sunday afternoon, July 29, A 20-25 knot westerly change expected later on Sunday will free up sails and see the wider planing boats such as Comanche and the TP52s accelerate away. 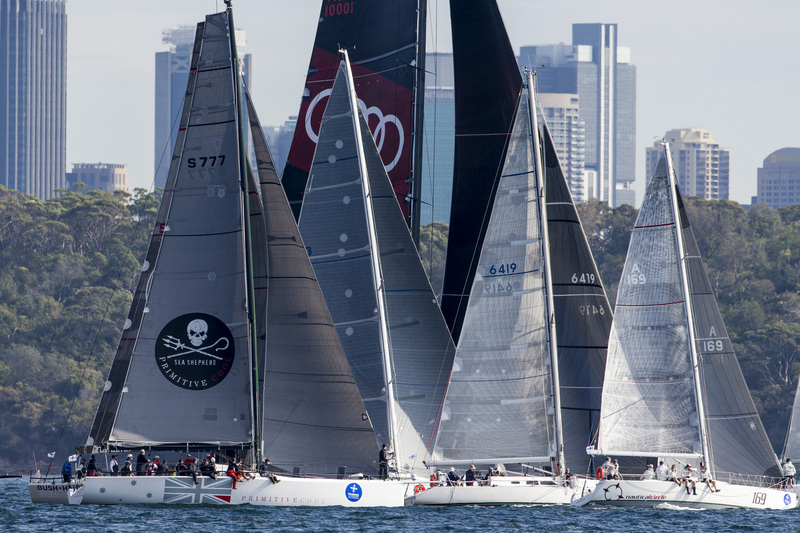 Five Australian states are represented in the 54 strong line-up of yachts ranging from 100-foot to the smallest, the Army Sailing Club’s 30-foot Gun Runner, second last out of Sydney Harbour on Saturday July 28. 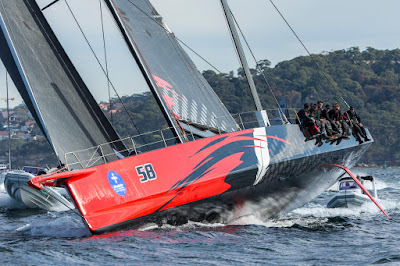 At 1830hrs Sydney time Comanche, Wild Oats XI and Black Jack were within 0.7 of a mile of each other on a similar heading, south of Lake Macquarie entrance and close to shore. Christian Beck’s InfoTrack was also in touch and on its way to being side-by-side with Black Jack and the innermost supermaxi of the lead group two hours later abeam of Newcastle. Ian Creak’s Beneteau 47.7 Ausreo, second overall in the 2017 Sydney Gold Coast Race, leads the early IRC pointscore from Kym Clarke’s Sydney 47 Fresh and Noel Cornish’s Sydney 47 St Jude.